Over the years, I've figured out how to hack my brain to recreate this phenomena, this cognitive state that I feel interconnected with spaces and people beyond my immediate space. It feels like I'm teetering on the edge of collective consciousness. I ask for your tolerance and forbearance as I wade into these weird, hard to describe recesses of my mind. This is something that I discovered this year. Or to state more accurately, I discovered how to talk about this cognitive phenomena I call the cosmopolitan high. Cosmopolitanism is based on the concept that humanity is essentially one community that transcends nations and cultures. We are one culture with a lot of offshoots and deviations, but we're essentially all in the same club. I first learned of this perception in an academic setting via the writings of a guy named Barnett Pearce. 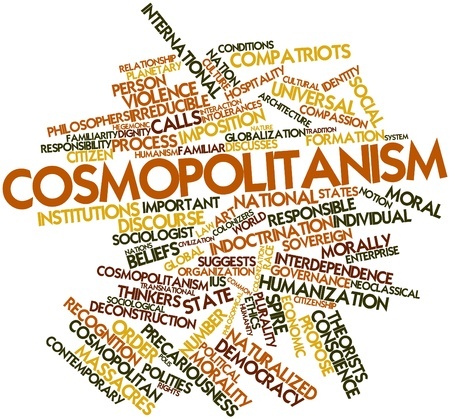 However, cosmopolitanism as a concept has been well traveled in many social science and cultural studies circles. I haven't performed a literary review or anything, but I don't know that people have framed the concept as I'm doing here. There are other, similarly documented psychological phenomena that I feel operate in the same space as this, 'cosmopolitan high'. It feels similar to the Michelangelo effect in that there's a similar sense of large scale euphoria and big ideas when in a high ceiling room. This cosmopolitan high of which I speak also reminds me of the Overview effect felt by astronauts that gaze upon the earth from space. I do feel as if this chemical reaction in my brain creates a similar cognitive shift in awareness that the Overview effect creates in those experiencing it. Initially, it seemed like there were these random things that created this certain state of mind. It's a subtle rush that feels like I'm breaking free of geographic constraint. It's like you're feeling you're everywhere at once. I'm a bit hesitant to get into this because my masculinity warns me that this is a bit too touchy-feely for who I envision myself to be. I call it a high because it is fleeting and it's a feeling I crave. Because it's not a perpetual experience, I consider it a 'high'. Yes, calling something a high creates negative connotation and I don't mean for this phenomena to be negative as it's quite the opposite. Recently, I started a list of these triggers for my own consideration. What I want to accomplish with this post is to present them to you in an attempt to further explain this cognitive state. I find a catalyst for this global, worldly feeling in music. For instance, I'll experience it when I listen to our local independent radio station, 91.9. This is a radio station that is very much not tied into a mainstream format nor is it dictated by some revenue driven guideline. The random music and segments feel very real to me and the content aired is as random as it comes. You'll find international, classical, new age, reggae, indie, and bluegrass tunes. The diversity in music and content feels like it's not tied to any particular geographic location, laying the groundwork for this shift in perception. This cosmopolitan high is also evoked by an array of music genres and artists. Electronic music can evoke this feeling as will Copland and Bernstein's Appalachia collaborations, for example. The banjo stylings of Earl Scruggs and other bluegrass, folksy music stir these feelings. I can also include Gregorian chants and bagpipe music on this list of musical triggers that make me feel interconnected. New Age music like Enya sparks this level of awareness. I feel like I'm all over the map here and feel that, now that I've admitted this in public, I have to hand in my heavy metal badge. There are a few unusual and seemingly disconnected situations that trigger this feeling. I'll sometimes feel this while watching some programming on public television. Maybe it's a similar situation to the independent radio mentioned above. Public television is a hodge podge of programming, often with diverse subject material. In a perhaps more obvious scenario, my family's recent trip to Disney World evoked this feeling. This, is partially due to the manufactured, biased simulations of various places throughout the world at almost every park. However, compound this fabled land with the fact there are so many people from around the globe that attend and that the staff are deliberately selected from all across the country and world and you have a sense that everything in the world is happening right here and now in the very place I'm standing. I also feel it at the airport, again for more direct reasons what with people traveling all over the world. It's the definition of the term, cosmopolitan. Major League baseball games and the large gatherings of people that come together and watch their team while charting the performance on the field with the scoreboard of divisional opponents displayed in the outfield. The Caribbean evokes this emotion. Perhaps it's the ocean and the romantic feel of the openness of the sea. Perhaps it's the history of the region as a realm for explorers and pirates from across the pond that fosters this experience that I can feel my way across the globe. Church will sometimes stir this cognitive state. In particular, the church I grew up in back in Dunkirk. The library almost always does. I have distinct memories of the Dunkirk library being a quite place of solitude that, upon entering, felt like a hub. I would often be alone there and being the age that I was, would not dwell upon it too much taking it for granted I suppose. Should I be pursuing the cosmopolitan high? My wife, in all her wisdom, brought an interesting perspective to this discussion. We've spoken before about the difference between joy and happiness and how there are advantages in seeking out the former over the latter. Joy is a consistent feeling where happiness is fleeting. She's pretty smart like that and if she ever wanted to write, she'd likely be the primary draw to Friday's with the Fords. That being said, I won't venture down this tangent but do understand the correlation between how I describe the cosmopolitan high with the fleeting feeling that is happiness. I don't know that I'm going to abandon quest to bask myself in this bubble, but whether or not it is a path to enlightenment is worth further exploration. So, this is something I discovered this year. I have spoken it into existence. I have exposed it to you. I discovered the ability to describe this state of mind and am now able to deliberately ponder where it can take me.